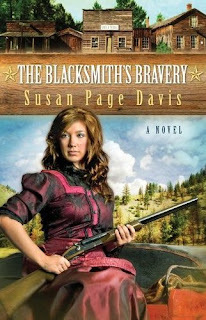 The Blacksmith’s Bravery—third and final book in my Ladies’ Shooting Club series—released November 1. I’m thrilled to see this one on the shelves and a little sad to be leaving the fictional town of Fergus, Idaho behind. When I first thought of this series, I wanted to write about a group of strong women who supported each other physically, emotionally, and spiritually. I wanted them to do something usually perceived as a man’s province. That wasn’t hard in the 1880s setting. My ladies wanted to learn to shoot. A murder in their town drew the women together out of fear at first. Widow Libby Adams, owner of the emporium, approached Gert Dooley, sister of the town’s gunsmith. She asked Gert to teach her to shoot her late husband’s pistol so that she could protect herself and her store. A rancher’s wife heard them shooting and asked if she could join them. Then the saloon owner, Bitsy Shepard, heard about it, and asked to tag along. Gert and Libby were faced with some decisions. They could have said no and let it go at that, but they saw women who feared for their children and their own lives—women who had no men to protect them or who felt vulnerable when their men were off tending to their ranches or businesses. Some women were friendless and outcasts of society. Libby and Gert decided to welcome all women into their circle and to teach them all to shoot safely. Their kindness and generosity brought them much more than they’d imagined. Women in the Shooting Club found friendships and wise counsel in addition to marksmanship. Of course this upset the men in Fergus. They wanted their women at home in the kitchen, not out shooting up their stock of ammunition. In the first book, the club nearly tore the town apart. But by book 3, things have calmed down a little and most of the citizens have accepted the ladies’ newfound skill as an asset. In keeping with the theme of the series, in the Blacksmith’s Bravery, saloon girl Vashti Edwards wants to take a further step into a man’s world. She wants to drive a stagecoach. Blacksmith Griffin Bane, who runs the stage line, wouldn’t consider himself intolerant. He just can’t imagine hiring a woman to drive stage. That’s plain crazy. He resists Vashti’s pleas to give her a chance, but finally allows her a toehold because of her shooting skill. She rides shotgun with an older, experienced driver on the Silver City run, and then gets him to teach her the fine points of handling a six-horse hitch. When Vashti earns her spot on the driver’s box, a new problem arises. A gang of robbers has targeted the local stagecoach line. Once again, the Ladies’ Shooting Club is called upon to face down the outlaws. I loved writing this series from start to finish. A research trip into the mountains of Idaho was a highlight. I learned so much—like how dangerous those mountain roads are, and how big crickets can get! The writing was spread over about a year for the three books. They stand alone, but as a trilogy they give the reader a full picture of life in this little mining town. The characters carry through from book to book, and you’ll see the romances blossom in fulfillment as you read on. After the first book (The Sheriff’s Surrender) I received a few comments that the romance moved too slowly. I feel it’s realistic, and Gert and her sheriff do work through their issues and get to the altar in the second book. Her brother Hiram, the shy gunsmith, overcomes his extreme timidity with women and lets his feelings be known in The Gunsmith’s Gallantry. Again you see the fruition of this romance in the next book, while Vashti and Griffin are beginning theirs. I believe I married off four couples in this series, and hinted at a future for another pair. This is historical romance with a dash of mystery and suspense, and a spoonful of growing faith. But it’s not “passion at first sight.” Most of my romantic pairs in the series have known each other for years before acting on their attraction. But their relationships are as solid as the mountains they live in. If you’d like to read more about this series and my other books, come visit me at www.susanpagedavis.com. Every month I give away a few books there (use the “Enter the Contest” form—I won’t use your address for anything else). I’d love to see you there. Right now I’m working on a new Prairie series about an Englishwoman who goes west to find her uncle. Look for the Prairie Dreams series next fall. Susan will give one copy of The Blacksmith's Bravery to a commenter on this post. Of all her books, tell Susan which one was your favorite and why. If you haven't read any of her books, that's okay, comment on why you would like to win this one. The drawing will be held on Monday the 22nd. Please be sure to include your email address if it isn't available in your profile.